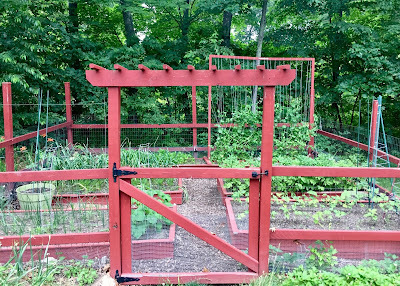 Most of us grow up hearing about how great earthworms are for the garden. Gardeners strive for a garden full of beneficial worms! They aerate the soil, break down organic matter from the soil surface, and expel their nutrient-full 'castings' (aka 'poop') underground for the benefit of plant roots. Whenever I found earthworms on our driveway after a rain, I enthusiastically picked them up and placed them in whichever part of the garden I thought needed them the most. Then came the discovery of the invasive Asian jumping worm. Believe it or not, here in New England we don’t have any native earthworms, as glaciers wiped them all out several millennia ago. 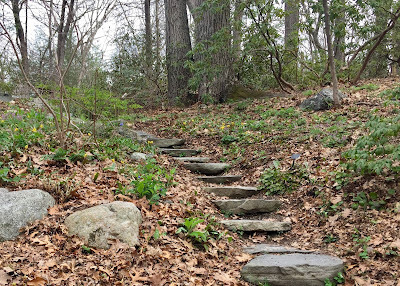 With no earthworms, our hardwood forests evolved in an environment where fallen leaves collect in a thick layer on the forest floor and decompose slowly. This leaf litter retains moisture, maintains the soil’s pH level, and supports a rich understory as well as the wildlife that live in such an environment. However, in the 1600’s, European settlers introduced earthworms back to the Northeast. 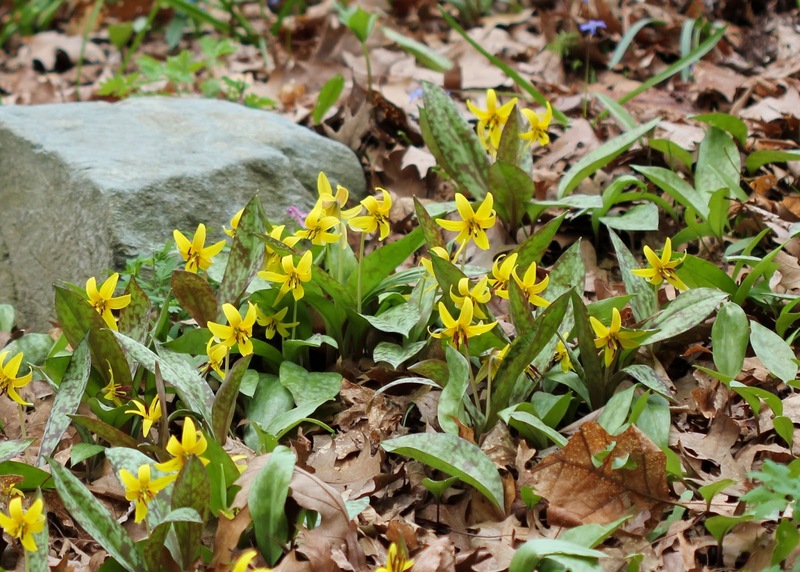 These non-native earthworms alter woodlands by eating the leaf litter that normally supports native tree seedlings and native wildflowers such as trout lilies, mayflowers, and trillium. The disappearance of this spongy leaf layer leads to the disappearance of insects and amphibians that live in it, which has larger implications in the forest ecosystem. Thankfully this process is very slow, as the worms do not spread very quickly by themselves. Enter the Asian jumping worm. Asian jumping worms have likely been in the South and in northern greenhouses for several decades. 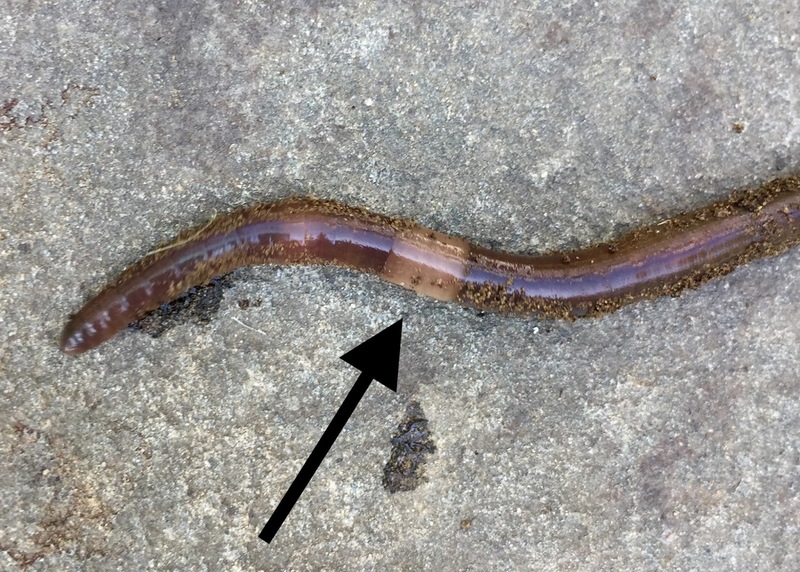 However, they were noticed in 2013 in Wisconsin as problematic, and since then awareness has grown about these earthworms, which are.... a little different. Instead of dwelling in deeper soil, Asian jumping worms live close to the soil surface, right underneath the leaf litter. Their dry, but nutrient-full castings are mostly left in the top two inches of soil, inaccessible to deeper plant roots. They work so quickly that scientists liken it to a dose of quick-release fertilizer. However these nutrients easily wash away - sometimes to where people do not want it, such as in waterways. 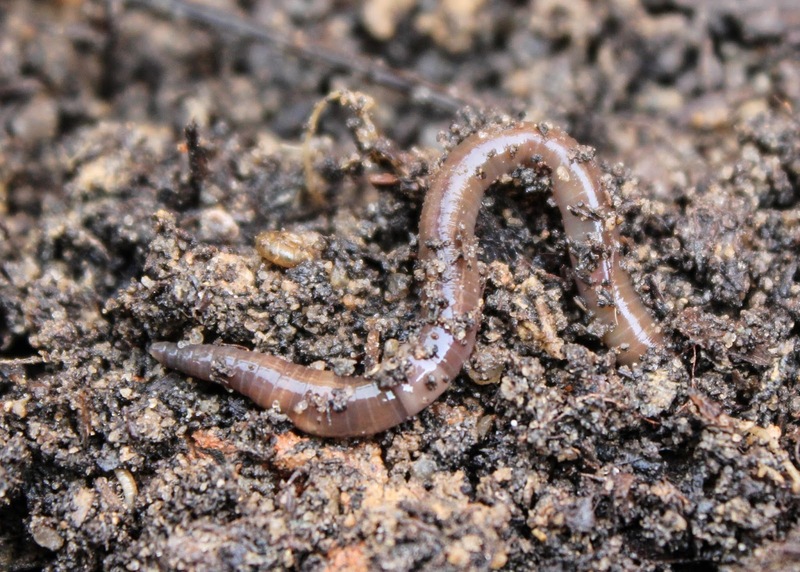 Soil occupied by jumping worms often looks churned, grainy, and dry, and it is more prone to erosion. These worms that I had so carefully rescued were Asian jumping worms, of course, and they are changing the soil in my garden. 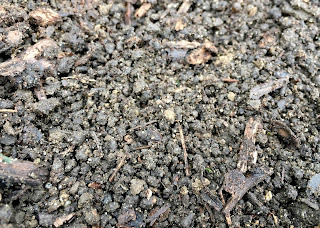 The top layer of my soil in many parts of the garden has turned into a gravelly field of loose, dry little pellets. While Asian jumping worms do thankfully die off in cold weather, their cocoons survive to hatch the next spring. Another difference between these worms and others: it takes just one. Jumping worms can reproduce asexually, thus it takes just one worm to make a colony in a new location. So how can you tell if you have these crazy worms? 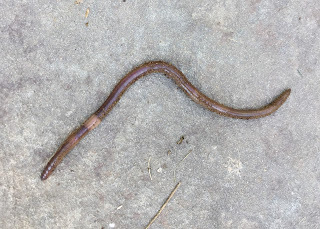 It's difficult to tell with young worms, but the adult jumping worms can be identified by their smooth, light-colored clitellum, which completely circles its body near the head. 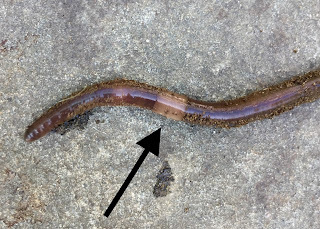 (The similar-looking European nightcrawler has a raised clitellum instead of a smooth one.) They also wriggle wildly (or jump!) when picked up or touched. 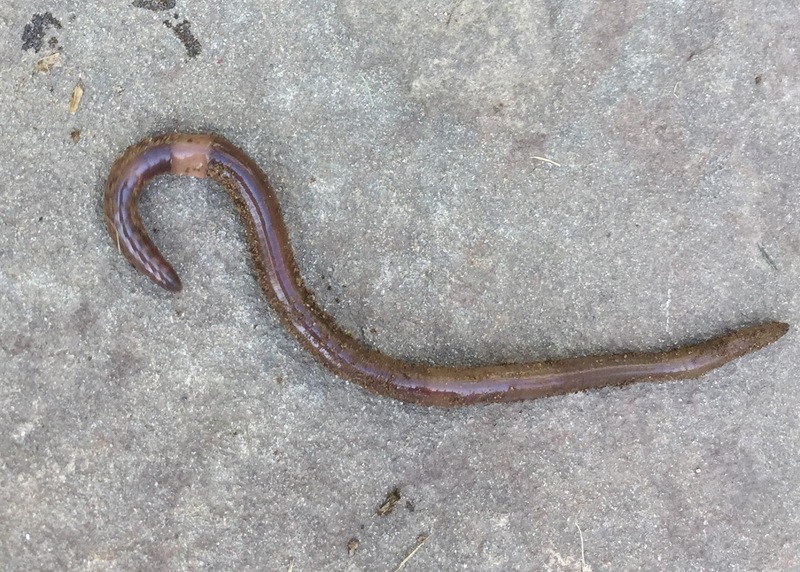 So what can be done about these invasive worms? Several states have launched campaigns to discourage people from dumping worms from fishing bait and vermicomposting in the woods, which exacerbates the problem. Several organizations in Wisconsins have even cancelled their annual plant sales in order to slow the spread of these worms. As for us, we can make sure not spread these worms by checking plants that we buy or share with others for worms and destroying any that are found. 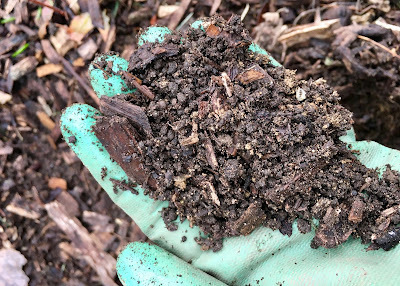 Acquire compost only from reputable sources where it has reached properly high temperatures, which would kill any cocoons. As for me, I will stop rescuing these invasive worms and putting them in my garden. 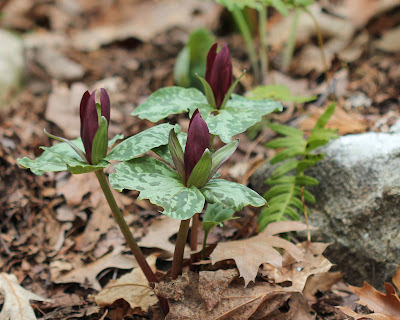 There might be snow on the ground now, but recent spells of spring-like weather have me in the mood to plant! Even though I really do have plenty of time before spring truly arrives, I feel a little behind this year, as I am still deciding my seed orders for this year's upcoming vegetable garden. So how did last year's garden go? It's evaluation time! ...and it possibly might be the last. It's just so much easier to order a bunch of seedlings, honestly. 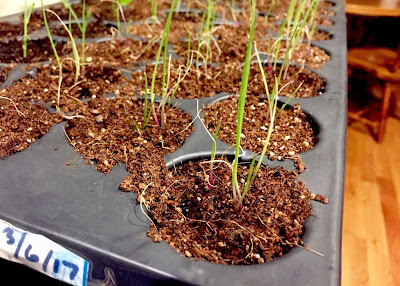 I've heard that one can grow bigger onions by using seeds, and I'm sure that is true, but I started the seeds on the late side due to travels and ended up with the same size of onions as always. I usually grow red storage-type onions, which lasts us through most of the winter. 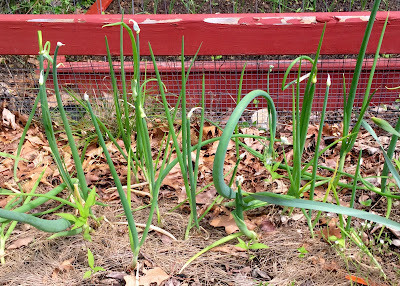 This year I was very excited to also grow Egyptian Walking Onions, aka Tree Onions. 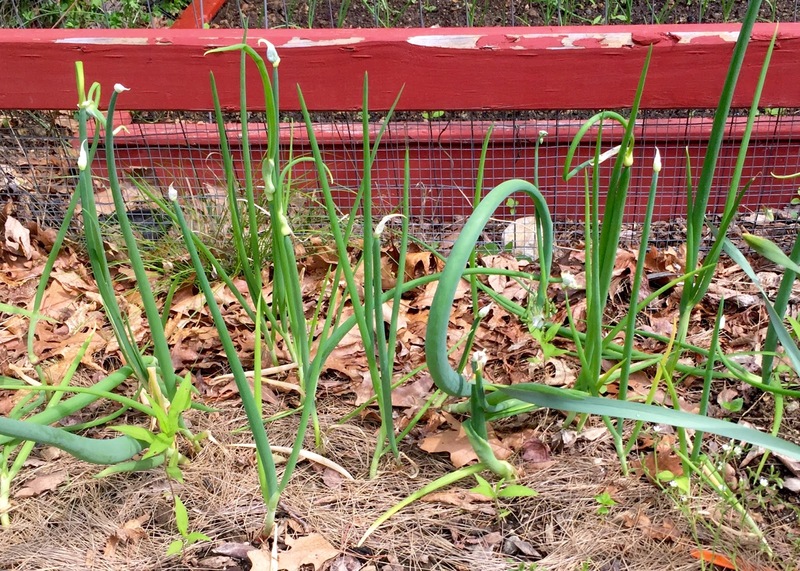 They are a perennial onion, and one can eat the bulb, the stalk, or the bulblets that form on top. They are called 'walking onions' because the bulblets weigh down the stalk, bending it down to the earth so that the bulblets can root. Thus the plant slowly 'walks' to spread to other areas. You can see a couple of the stalks in the picture below already bending down to start their stroll. 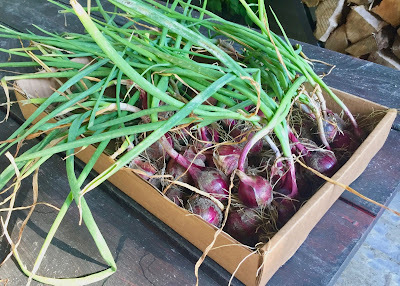 This year we ate mainly just some of the stalks as green onions, so that our patch of Walking Onions could increase. They were strong with a bit of a spicy kick, which we enjoy! The best part about them, though? Nothing else eats them, so I could actually plant them outside of my fenced veggie garden. 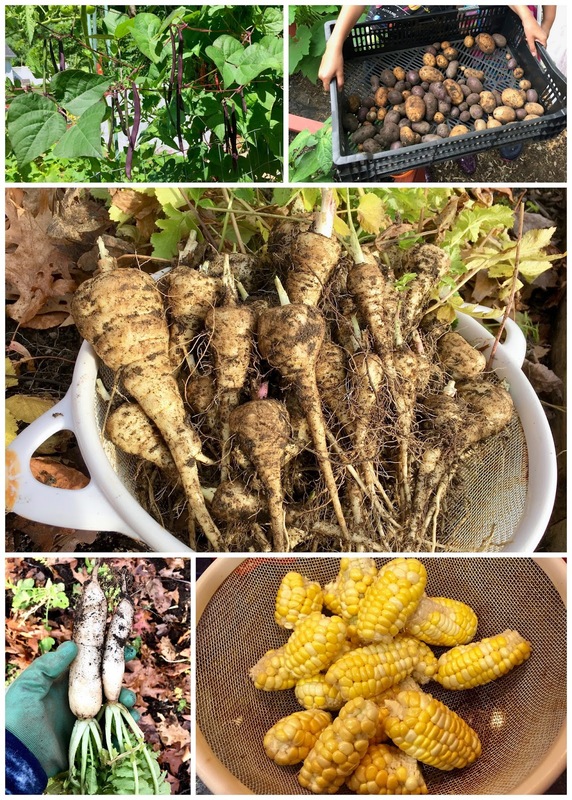 I love trying new things in the garden every year and discovering new favorites to grow. 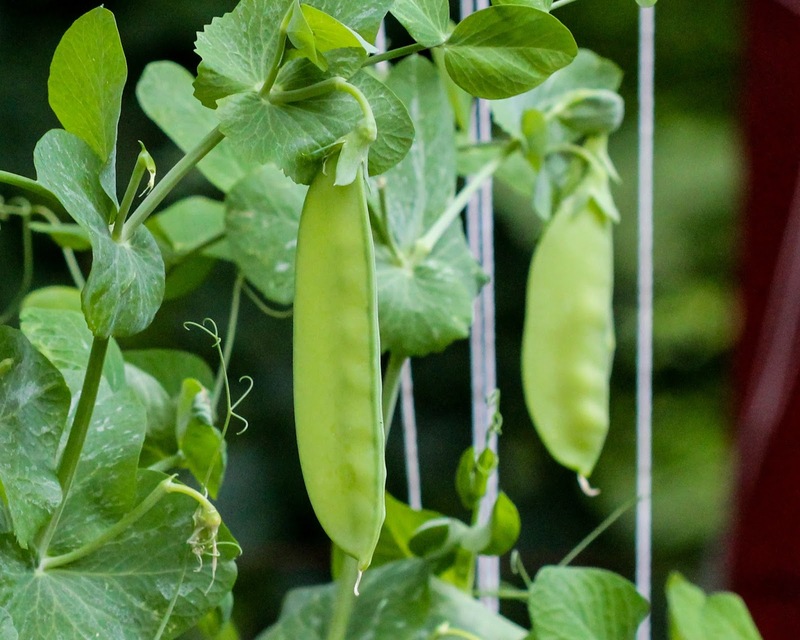 Out of the new varieties we tried this year, my hands-down favorite was the Purple Podded Pole Beans. They were prolific, indestructible, and delicious! One of my daughters also discovered how much she liked parsnips (always a win!). A carb-lover like most kids, she had so much fun digging and eating the potatoes out of my garden that she wants to grow them in her own garden this year. The kids also enjoyed the Sweet Corn, even though they ended up being more like corn 'nuggets', if you couldn't tell from the picture. Our poor corn plants lived quite the hard life, having been completely knocked down by a strong storm and replanted/propped back up into place. 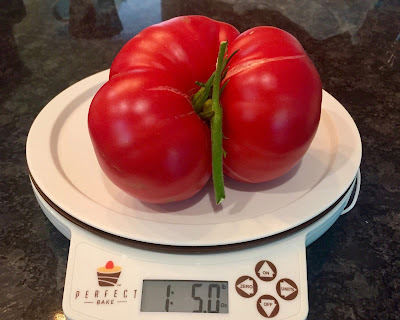 We also grew the usual suspects of garlic, peppers, and tomatoes, and I was able to can over a dozen jars of salsa in the attempt to keep us in salsa until the next harvest. 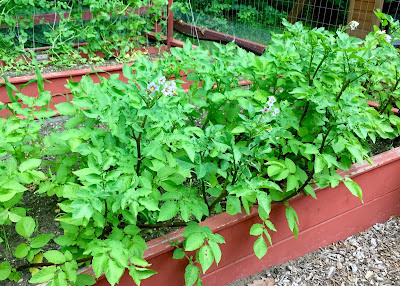 This year I tried growing Brandywine tomatoes again - but in the greenhouse and away from the chipmunks this time. They were as impressively delicious as everyone said, though I think I still prefer the Black Krims. The Brandywines also didn't really produce quite as many tomatoes, either, though I did get one impressive 1.5 pounder! 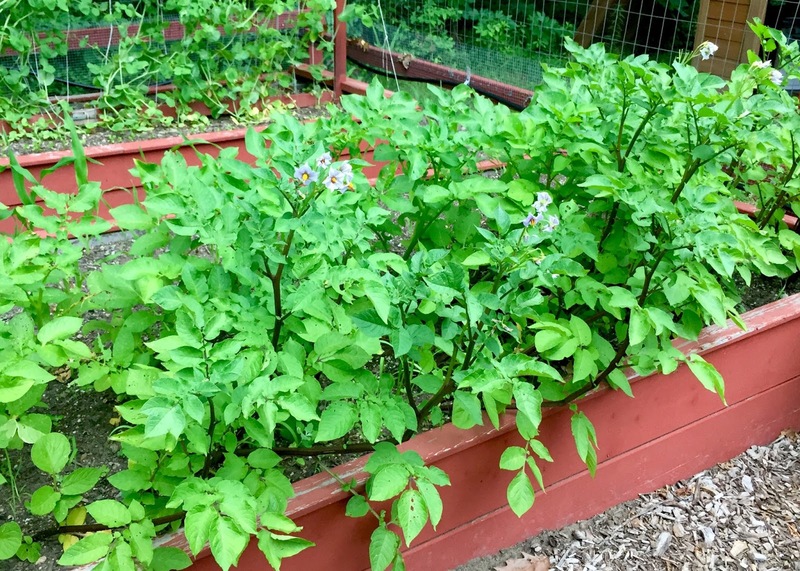 Our tomato season is just so short up here, and by the time tomato plants really get going, it starts getting cold. 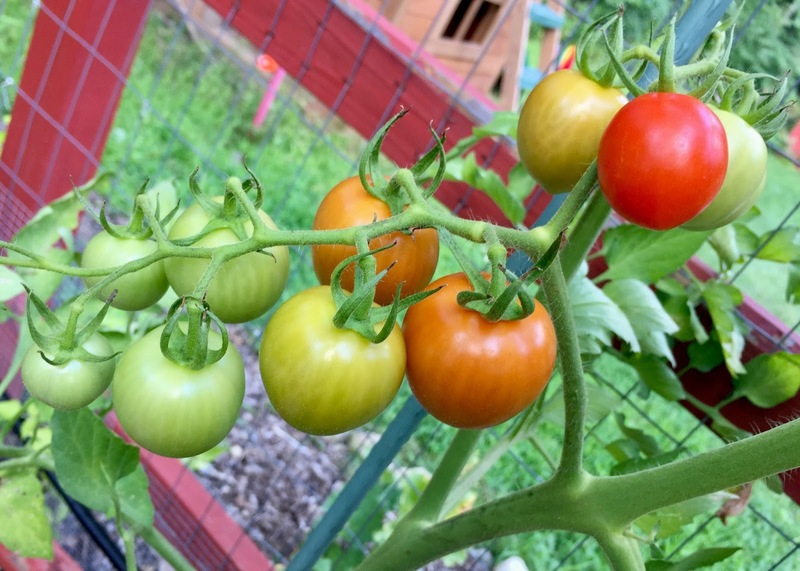 My favorite tomato varieties this year? Black Krim, Chocolate Cherry, Brandywine, and Magic Mountain. I had one dud, the 'Green Vernissage' tomato, which I unfortunately grew from a complimentary free seed packet. Maybe others like it, but I thought it tasted so awful that I cut the plants down. 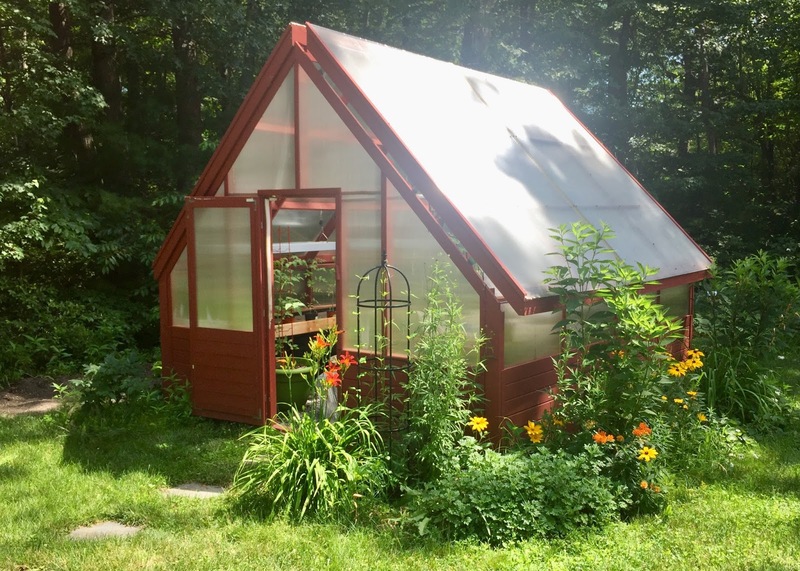 My greenhouse space is at a premium, and that one was not worthy! Of course, every year there is some sort of pest to deal with. This past year I found myself with a deluge of slugs and grubs, which cut down pretty much all of my lettuce and spinach that were in those beds. 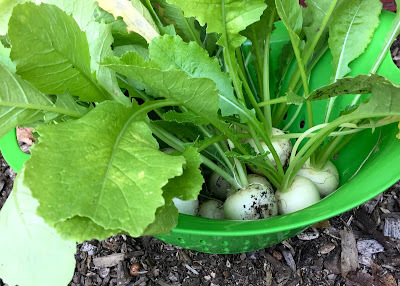 I consoled myself with how pretty my favorite turnips looked, grown under a row cover and away from the usual flea beetles. 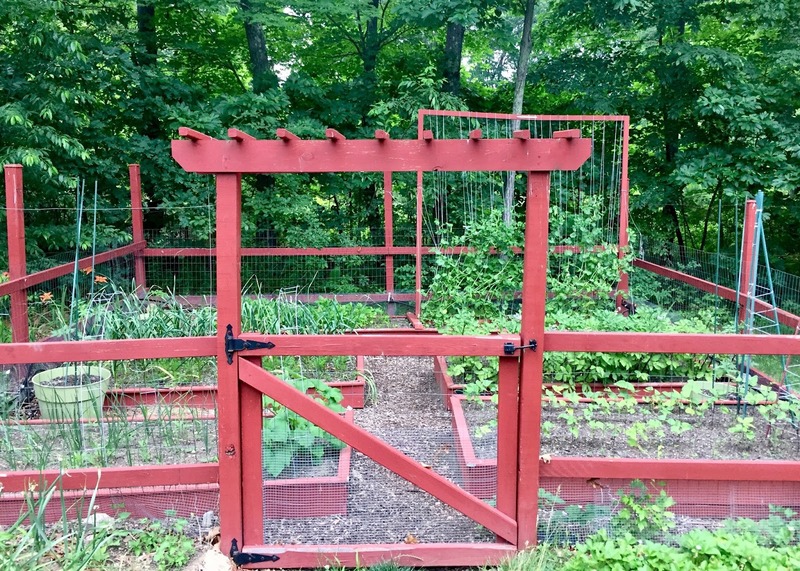 So what new ventures shall this year's garden bring? 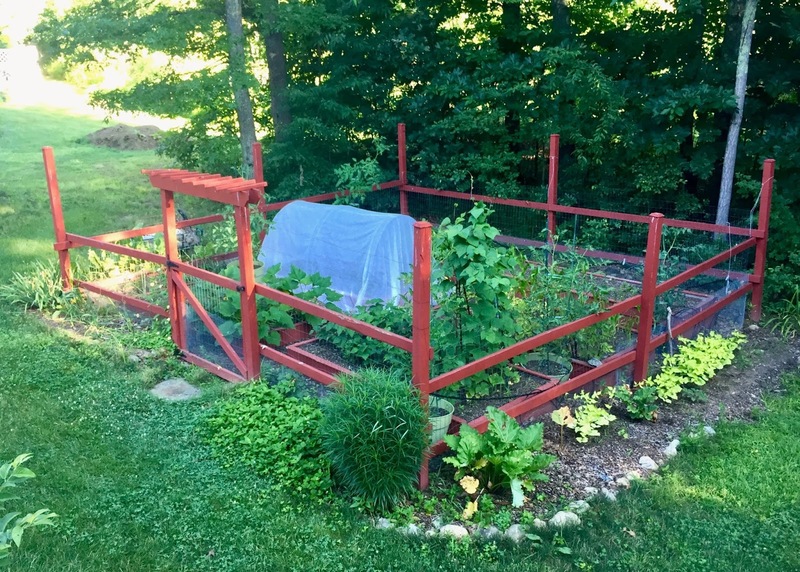 Perpetual spinach? Wonderberries? 1500 Year Old Cave Beans? There's always something new to grow and discover. Anyone growing anything new and exciting this year? 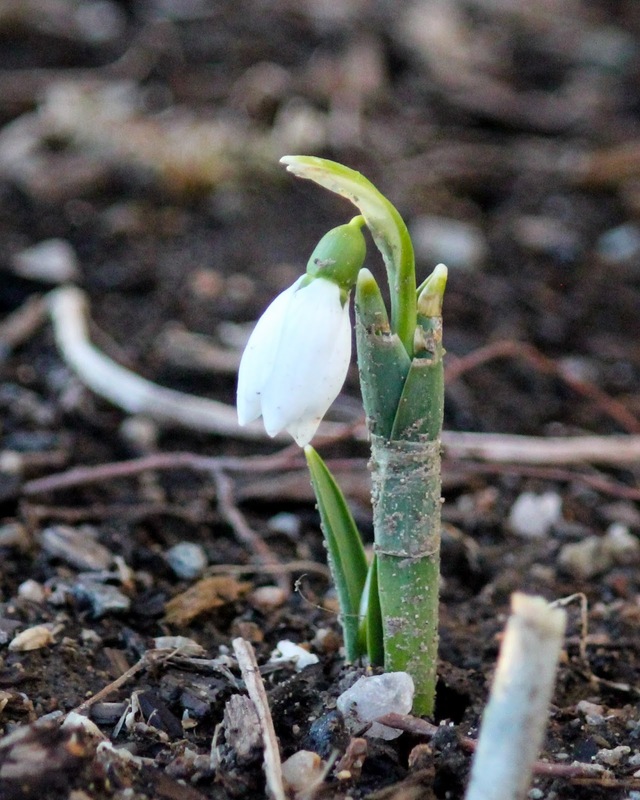 and the first breath of spring. under the blanket of tomorrow's snow.